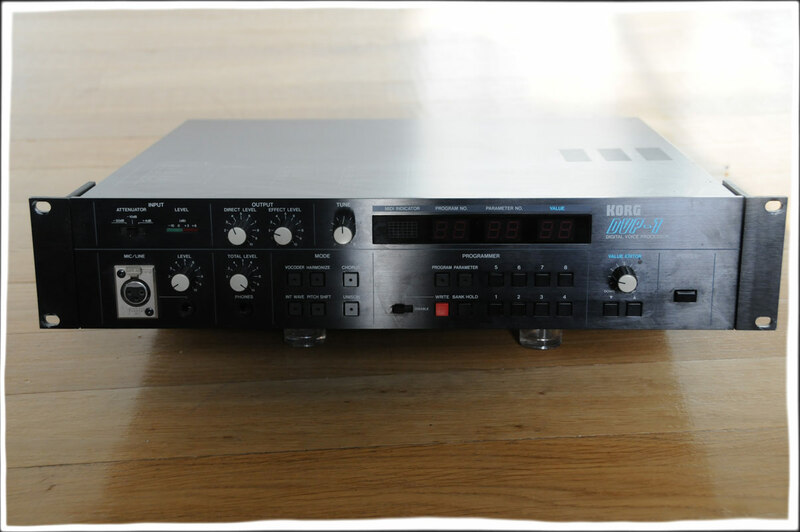 The Korg DVP-1 Digital Voice processor was released in 1986. It consisted of a Vocoder with its own internal waveforms, a five part Harmonizer, a Pitch-shifter and an Internal Synth. The Vocoder is very intelligible and while the Harmonizer does not sound super realistic, it has its own unique effect. It has five polyphonic voices, four with chorus on, unison mode and 64 memory patches to store your settings. Outputs : Direct out (impedance 1 kohm), Mix out (impedance: H:L 1 kohm, L=10kohm; output level H:L= 10:1), Phones out. Harmonize mode	Key note, Key change, Chord memory, Chord (Note1 ~ Note5).